Hopefully you already have your brushes in a way that keeps the bristles in nice shape, but doesn’t allow mildew to grow. Brush wallets are the perfect solution and one of my favourite ways to store my brushes safely not just for myself ( one pack for each medium. all clearly labelled) but also for the brushes we use in our art classes. 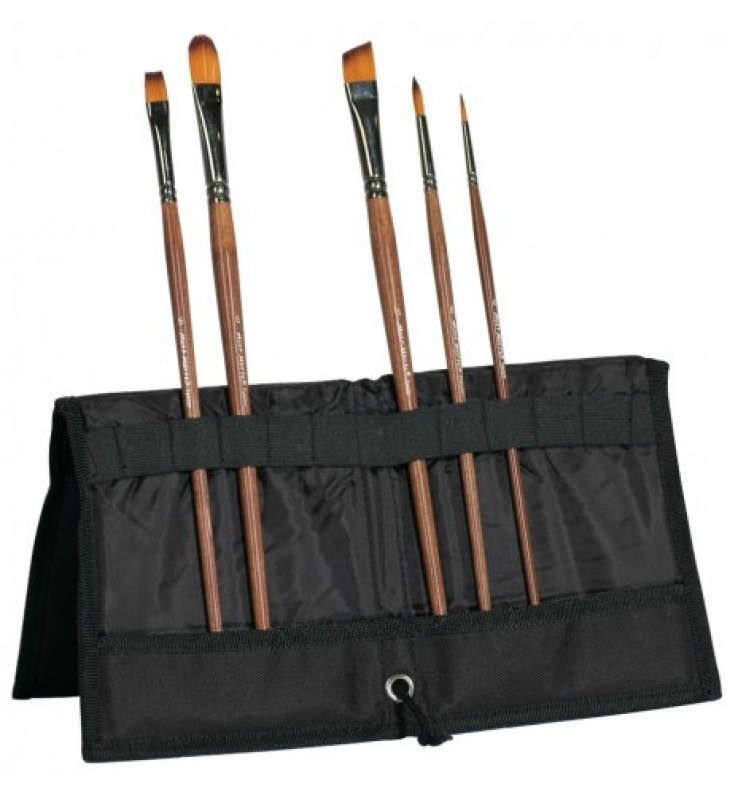 They are perfect prevention for the time when you pull your favourite brush out of the bottom of the art bag and the hairs are all bent over in a permanent curve. Well it’s not really permanent, just very time consuming to fix! I have had some tragedies with some of my most expensive brushes in the past, and I thought I’d share with you the answer to prevent it so that you don’t have to go through it like I did. One time I hadn’t used my large, expensive Chinese ink painting brushes for a few months. I opened the box up to find that the bristles were suddenly shorter and ragged and not the original shape at all. In fact some of them were so far gone that they were completely unusable! When I looked closer I found that there were moths in the crate where I stored all my Eastern brush equipment. The moths had gotten in and eaten away at the bristles, some of them right down to the ferrules. Horror. Of course this will never happen with synthetic brushes, it only happens with the natural hair brushes like the hog bristle, and of course also the very expensive fine sable, or precious squirrel hair brushes. One solution is to make the decision to simply stop using the natural hair brushes and only use synthetic, but this doesn’t work for me because the natural hair brushes soak up a lot more liquid in their bristles, which means that you can paint long, smooth lines in a single stroke. So my solution was an old fashioned one. First, I cleaned out all the evidence of the moths, really thoroughly, and tried to make sure there were no tiny little specs left in there that could have been eggs or larvae. The sad part was the step of ruthlessly throwing out the brushes that were no longer usable (not even for masking or scratchy work!). Then I put the prevention measures in place. There are two major ones. I put several nice stinky mothballs into the box, right down into the corners. I took my very precious extra large Eastern hair brushes and wrapped the bristles carefully and thoroughly in clingwrap, keeping the shape right, wrapping several layers over, and finally taping the open end down very tightly over the ferrule. I made sure to keep the tape only on the clingwrap in case the adhesive got sticky over time and ended up being hard to get off the brush. Then I put them back into the box with the mothballs and all the other equipment. I checked on the box closely after a couple of weeks to make sure that no moth eggs had hatched. You need to regularly check the box and replace the mothballs, preferably every 3 months. Putting a recurring reminder in your computer calendar is a great way to make sure you remember. The climate is wonderful living in the tropics or subtropics, but we pay the price for having to take extra care to keep the insects at bay in the studio. Using these steps has saved my brushes and saved my money and happiness as well! Have you ever had any unwanted visitors in your art supply? How did you handle it?